A luxury home combines the vision of the architect and craftsmanship of its builder. The exterior and interior living space is a unified expression that brings together hundreds, if not thousands, of individual elements that create a seamless blend of beauty, comfort and value for its owners. However, the home in and of itself is truly just the beginning, as the design and elements of the surrounding land is the finishing touch that often takes the entire property to another level of opulence and luxuriousness. 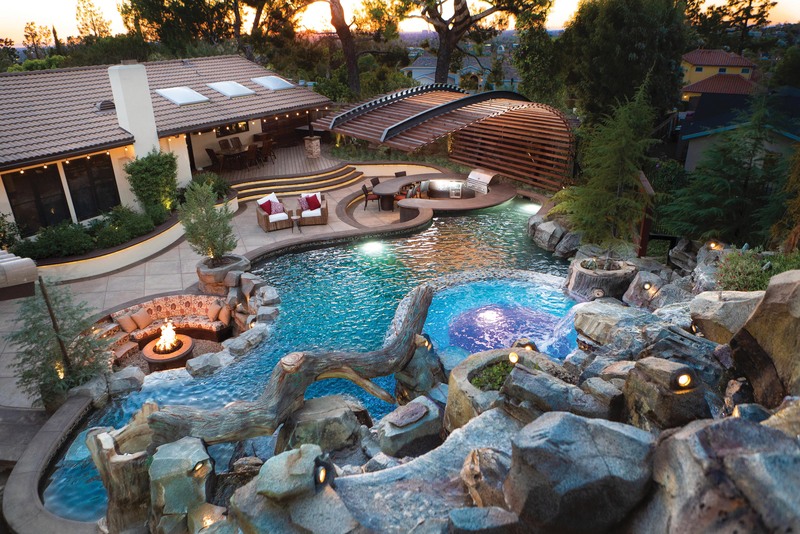 Creating a dream hardscape for a luxury home is best not left to those simply offering a long list of swimming pool shapes and sizes, with or without a spa, and adding options from fire pits and barbeques to gazebos and a few palm trees. It is the difference between putting together a ho-hum modular design or creating a stunning custom masterpiece. The owners of luxury homes worldwide have long known who to call for a custom hardscape creation second to none. 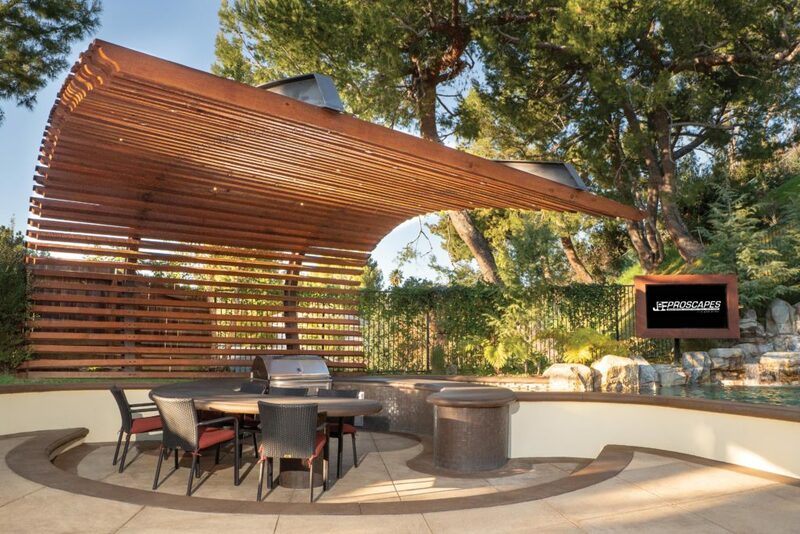 JE Proscapes owner, Jesse Escalera, is a legendary top creative landscape designer and pool contractor with a 20-year portfolio of stunning artful outdoor living projects found all throughout Los Angeles and Orange Counties and both nationally and internationally, as well. The hallmark of a JE Proscapes creation is Jesse’s vision for personalization and the inspired blend of the latest products and trends. This is then further enhanced with a number of one-off artistic touches that together creates a unique overall theme and a tailored one-of-a-kind hardscape for luxury outdoor living at its very best. Jesse Escalera with his wife Sarah in their sleek black Mercedes-Benz Executive Sprinter that is their mobile office. At the appointed day and time, a sleek black Mercedes-Benz Executive Sprinter pulls into the driveway. It is Jesse’s mobile office that plays a key role in the initial visit. He also takes note of the home, how they dress and what kind of cars they drive. The goal is to creatively tailor a design and lifestyle experience that not only accents their home and lives, but is far better than they could have ever imagined versus just a “pick-and-choose” checklist of options and features they thought they wanted and would have selected on their own. “I am first and foremost an artist,” Jesse adds, “and I set out to make each project a highly stylized, one-of-a-kind masterpiece created just for that client… something unlike any other and that they know is tailored just for them in every respect.” His reputation in the Southern California market has generated demand for his artistic prowess, as he now provides design consulting services to clients across the country and around the world. Lots of people have difficulty visualizing how a finished project will look, and that’s where Jesse’s Mercedes-Benz Executive Sprinter comes into play. “Let’s step into my office and I’ll show you some images to give you a better idea.” The set-up includes two big screen TV’s – and, while the owner and family watches – the maestro begins orchestrating his vision over an image of their home (pulled off of Google Earth) that quickly leads to examples of special finishes and custom touches created just for them. Jesse is back in a few weeks with beautifully detailed renderings of what their home will look like. Customers aren’t just pleased or happy, they are totally blown away with the intricate personalization and creative design. Birds-eye view of one of Jesse’s backyard designs. Once the design and budget are finalized and approved, the project is entered into a computerized construction and scheduling system that takes the project from vision to precision. Every aspect achieves specific milestones and completion dates for the JE Proscapes team. When finished, in addition to everything one would expect in a custom created luxury hardscape, each JE Proscapes project takes outdoor living to an elevated level with unique surfaces, split levels and a highly personalized theme that brings fire and water and landscaping and lighting together in a way that only Jesse can. DREAMS: Talk to us about your early days in business. What was your upbringing like and how did you get started? Jesse: I was in a gifted and talented education program at school until I had to stop going and start working at 14 years old. When I turned 14, both of my parents got sick and I had to leave school to take care of my family. I lost both of my parents at a young age, so ever since then I’ve been working to provide. We wound up living in a motel for three years in Stanton, CA. Most everyone in there was a drug addict, prostitute, selling drugs or all the above. Some of the worst-off people I’ve ever seen in my life. There were people living there that had a heart of gold… but some were real animals. One terrible guy really took advantage of me. He knew I had no choice but to work to support my brother and dad at the time, so he offered me a job. I was 14 years old and they would work me 12 or 14 hours a day, and then at the end of the week they’d only pay me for 40 hours of work, even though I was working 60 or 70 hours. I was being taken advantage of, but I had no other choice. If I didn’t work and get the money, we’d wind up on the street. That was the first experience I had working in construction. After that call, I got to thinking about it. I had enough money to pay this guy to crash on his couch for another month; or I could take the little bit of money I had and take a shot. I looked around at where I was living and thought, “What do I have to lose? I have nothing. Worst case scenario, I end up on the street.” What would have been even worse is if I didn’t at least give myself a shot at success. I remember being scared the first time I went out and worked. I didn’t have any confidence, didn’t know what I was doing. Funny story, I went to Home Depot the night before and found this book for handymen. I couldn’t afford to buy the book, but I sat there reading it trying to absorb all the information. Eventually I bought the book and I still have it. I’m going to frame it in my office. DREAMS: How did you overcome the challenges associated with growing the business? Jesse: It was a struggle for a long time. The first decade, I didn’t make any money. I’m more of an artist than a business man; at least I was in those days. But eventually there were a couple of big turning points. The first major break was when an influential couple asked me to build a project they had a famous designer create. I’d never done any job even close to the size. The wife said to me, “This guy is a world-famous designer. We paid $20,000 for the design.” I had a lot of pressure on me to live up to this guy’s standards. I told them I’d be back in a week with the bid. As I started pouring over this guy’s design, I realized I just wasn’t that impressed. I felt like I could do better. But I didn’t want to say anything – this was a huge job for me – so I went and saw her and gave her the bid. She said, “Great, you’re hired. You have the job.” But she could sense something was wrong. She said, “Jesse, what’s on your chest? Are you not excited to have the job?” I basically said, “We can do better.” I was expecting her to kick me out of her house. Instead, she replied, “Well, Ok. Why don’t you take a shot at a design and we can see what you come up with.” I left feeling like a total idiot. I took four or five days to painstakingly go over every detail. I wound up redesigning the whole thing. I took the risk of going back there and insulting these people or insulting the designer. When I went back, I was scared. I basically gave them a disclaimer that these were just my ideas and we could go with the other design. She opened it up and looked at it, then grabbed the other guy’s design, smashed it up into a ball and threw it away, saying “We’re going to go with your design. And if you get any more ideas during the project, you let me know. Blank check. Whatever you want to do.” To this day, she’s one of the biggest cheerleaders in my life. Another big turning point in my business was when the market crashed during the Great Recession. I had started to make a name for myself in high-end, custom design. During this time, my business just got busier and busier, because my clientele is the cream at the top and weren’t as affected by the market crash. In fact, they were the ones going around buying everyone’s stuff getting richer. There were a lot of cookie cutter contractors calling me for work, but we just went the other direction and stayed in the high-end market. Because I remained true to my abilities, people have come to expect a certain level of design and finish. Today, people even fly me around the country, around the world, to design their projects. Most of the work Jesse does is highly-custom, with no two projects ever being exactly alike. Pictured here is the first ever wave patio cover completed by JE Proscapes. 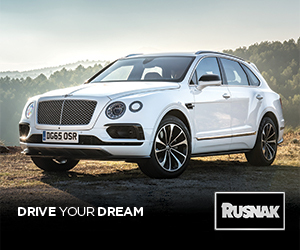 DREAMS: What are the personal attributes that have helped you create success and build your brand’s reputation? 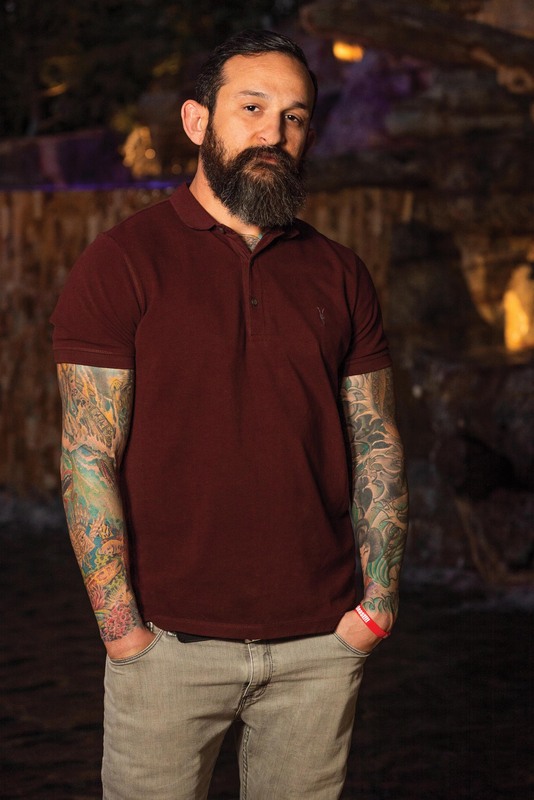 Jesse: I won’t compromise my integrity. If it costs me money to never compromise integrity, then so be it. I won’t compromise the design or project just to make money. I’ve even torn stuff out that the client liked because I knew it could be better. At first, they get mad at me. But once I’m done, they’re like, “Oh my God. That’s why we hired you. This is so much better, thank you for fighting me on this.” It’s like a curse I have that all my clients know about. If I’ve made up my mind about something that I think will make the project better, I’m hellbent to see it through. I might move a 200-foot retaining wall over 6-inches, just because it makes such a big difference. I don’t say this to be cocky, but the last 15 years have been nothing but home runs. This sort of skill and confidence didn’t come overnight – it came through all the years of paying attention to every little detail and not being afraid to show the client something can be better. 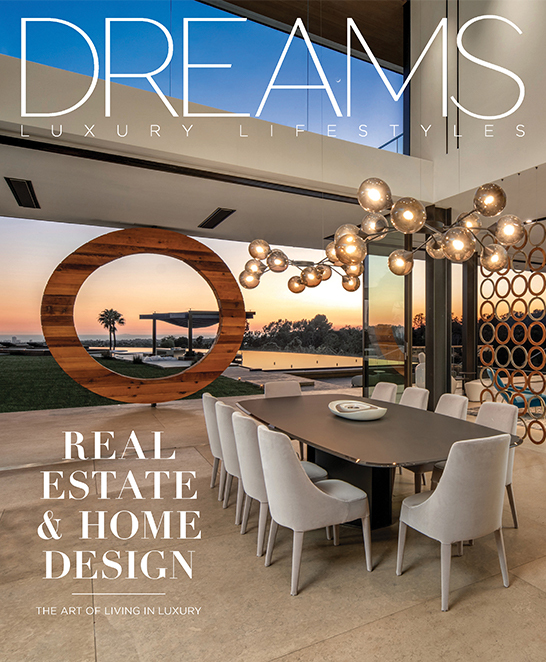 DREAMS: How do you stay inspired and keep coming up with these high-end, one-of-a-kind projects? Jesse: I’ve been an artist since I was a little kid. I romanticize and obsess over every project; and truly I love what I do every day. I’m extremely ambitious and always look toward the future. I think a lot about my own mortality. Where I came from – poverty and hardship, losing my parents, being homeless – every day I feel like it could be my last. I think a lot about what happens when my life ends. I believe when I die I’m going to meet a version of myself and have a conversation. I want to meet that guy at the end of my life and go, “You know what, you turned out the very best you could have. There was nothing lacking, no effort not taken. You burnt the candle at both ends and really went for it.” What terrifies me is meeting this guy at the end of my life and having regret about things I didn’t do. I don’t want to meet that guy. Because of this mindset, every day I’m pushing and striving for more. Jesse and Sarah Escalera enjoying one of the backyard landscapes designed by Jesse. DREAMS: What are your aspirations for the future? Jesse: One, is continuing to grow our design and build firm. We will always design and build because what we do is so custom, no other builders even want to try it. Earlier I mentioned that I’m more of an artist when it comes to my business, but luckily, my wife Sarah is really talented when it comes to running aspects of our business like marketing and its overall organization and structure. Everything we do is with max efficiency and that really started once she came into the business a few years ago. Because of her abilities, I’m able to take on more and more projects and even provide design consulting services on projects all around the world. The other thing we’re doing is designing and building vacation properties. We design these properties so that people can experience my design when they’re on vacation. It’s almost like renting my art. While doing these properties, we’re building this real estate empire through buying and holding. It’s building a legacy and generational wealth we’re after. That’s the name of our real estate company: Legacy Development. Additionally, we’ve been featured several times on HGTV’s Flip or Flop, and coming soon we have a one-hour episode of Christina on the Coast, where we’re designing her entire backyard. In the future, we’d love to have our own show. We’ve been offered a few opportunities but have turned them down because it wasn’t a fit. I’m waiting for the right opportunity. At the end of the day, I’m an artist designing super high-end, custom landscapes. I put my heart, soul and every bit of talent I have into each project. Ultimately, the artistic expression of the project and having the client absolutely love what we did for them is what’s most important to me. 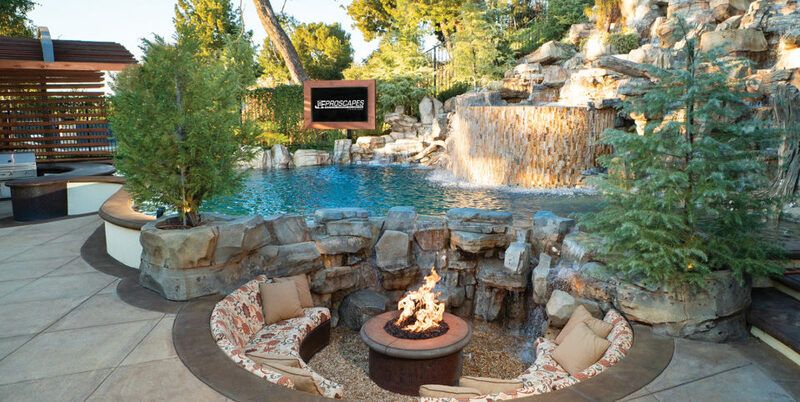 To learn more about JE Proscapes visit newportlandscapedesign.com or call (949) 326-7536. Connect with JE Proscapes on social media: Instagram & Facebook – @jeproscapes; Twitter – @ProscapesOC.